Be sure to check the flat areas on both the deep and shallow sides of the break. Most often the best fish will be active very soon after you start fishing a hole. After you’ve fished a spot for a while, fishing will either taper off, or the size of fish you’re catching will decline. This is the time to move on, you can always come back and check some of these areas later in the day, after the fish re-group. But to locate premium areas you need to keep moving. Mid season Perch are easier to locate out near the main lake bars and humps. A handheld GPS, A simple GPS Lakemap and a Flasher will really pay off out here. Fishing these structures, it’s best to check for fish on top of the bar and then check again out on the deeper flats. Many times these fish are relating to the structure, but hold out on the flat in water 30 to 35 feet deep. Watch your flasher over the deeper areas closely for schools of minnows. If your flasher dial doesn’t light up with bait occasionally, plan to move on at the first sign of slowing action. Another key main lake pattern is the soft bottom areas on the edges of these bars and humps. Larvae in the "mud" will attract groups of fish and baitfish. You’ll find Perch feeding on these larvae with mud sticking to the roofs of their mouths. The larvae won’t leave the area like minnows will, so the presence of this food source will hold fish over longer periods of time. Late season action heats up on the shallower flats as the fish begin to move into spring feeding and spawning areas. Water depths are typically 10 to 20 feet and weed beds, sand grass or clam beds begin holding groups of fish. Like the mid season pattern, the presence of larvae on the soft bottom flats continues to be an important food source and will hold large schools of Perch in an area for days at a time. Moving to locate the fish is still important, but spring fish tend to stay in an area longer and you can usually find a spot to call home for the day. It’s easy enough to get out there too. With help from the area bait shops and resorts, you can find plowed roads leading to good fishing areas, plenty of bait, tackle and advice, even fish house rentals. Most anyone can find enough fish to make a great weekend getaway and find a cure for "cabin Fever". Lake Winnibigoshish; known as "Big Winnie", located in North Central Minnesota’s Chippewa National Forest has become famous among Perch anglers throughout the Midwest. This resilient lake provides reliable action and a better than average chance at true "Jumbos". Consistent Perch angling can be found easily by following a few simple principles that should help you take advantage of the main seasonal patterns and basic habits of the fish. Simplicity is one reason that Perch fishing has become so popular. Most of the baits are equally well suited for shallow or deep water and will catch fish in a number of situations. It is unlikely that you’ll find a situation where only one bait produces. In fact most often, a group of anglers that are all fishing with different baits will all be catching some fish. There are times though when one will out produce another and it is a good idea to try different approaches. Presentations vary, although jigging blade/spoon type baits like The Swedish Pimple or one of the countless imitations, account for catching a lot of these fish. This type of jigging bait is best when fish are aggressive. The most common approach is to tip the hook with the head or other small portion of a minnow. Lift and drop the bait every few seconds with plenty of pauses to allow the fish time to strike. Swimming jigs and many of the "Perch Eye" imitations are a great way to present live-whole minnows hooked in the tail. One of my favorites is a small 1/16-oz jig that is about the actual size and shape of a Perch eye. This works better when the fish are less aggressive or when more "pause time" is required. Perch will sometimes react better to these baits when they are gently moved or even laid completely still instead of the traditional jigging approach. Many of my friends use the same ball type jig head that you would normally use for Walleye fishing in the summer. A whole minnow hooked through either the mouth or tail can be jigged or fished slowly or even laid on the bottom. This is a simple, proven and consistent approach that should never be overlooked. Color choices vary, but I think it pays to use any combination of colors that resemble either of their two main food sources Crawfish or Small Perch Minnows. Combinations that include "glow in the dark paint" are particularly effective. 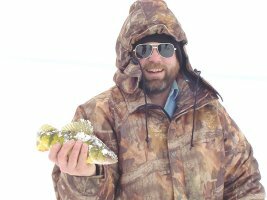 First ice and early season is a bonanza for those who get out on the large, shallow flats and shoreline breaks. Large schools of mixed size fish roam the flats searching for minnows and can be really aggressive. One of the great advantages of this early season shallow pattern is that fish can be easily released and you can pick out some of the better fish without doing damage to the rest of the school. Locating schools of fish feeding on minnows is a matter of moving along the breakline and checking for active fish.